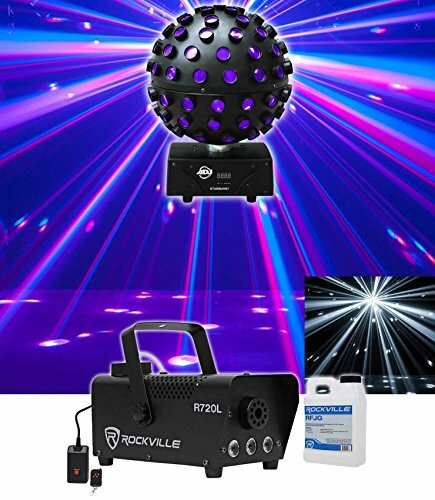 Rockville R720L Fog/Smoke Machine w/ Wireless Remote+Multi Color LED Built In! American DJ Starburst LED Sphere Multi Color Shooting Beam DJ Lighting Effect FX. 5 x 15W 6-in-1 HEX RGBWY+UV LEDs (Red, Green, Blue, White, Yellow & Purple). Produces 34 crisp, bright beams. Beam Angle: 1 Degree. 13 DMX Channels. 3 operational modes: Auto Run, Sound Active, DMX Controlled. Stand Alone or Master-Slave Set-Up. Rockville R720L Fog/Smoke Machine w/ Wireless Remote+Multi Color LED Built In! Fog machine with built in RGB LED lights. Each LED is 3 Watts. Top of the line Tianxin brand LED's are reliable, bright, and have amazing performance. Output: capacity 3,000cfm (cubic feet per minute). Fog fluid included (0.6L). 3.5 minute start time (fastest on the market for a similar priced unit). Manual fog button. Wireless timer remote included. Hit one button and 30 seconds of fog will come out. Water-based fogger compatible with standard fog fluid made by Rockville, Chauvet, American DJ, Visual Effects, and other famous brands. 10 Fluid ounce tank capacity. Fluid consumption: 10 Fluid Ounces per hour.